European champion Portugal failed to overcome the absence of Cristiano Ronaldo this time, and lost 2-0 to Switzerland in a World Cup qualifying match on Tuesday. For Portugal's first competitive match since beating France in the Euro 2016 final, Ronaldo was left out of the squad while he recovers from the knee injury sustained in the opening minutes in Paris. A Swiss team which mostly lacked spark in France fired into life with two goals midway through the first half at Basel. It also had midfielder Granit Xhaka sent off in stoppage time for a second yellow card. Breel Embolo headed the opening goal in the 23rd minute, reacting fastest to goalkeeper Rui Patricio's parry of a Ricardo Rodriguez free kick. A fine fast break in the 30th was finished by Admir Mehmedi with a curling shot into the top-right corner of the Portugal goal. Mehmedi had taken a return pass after finding forward Haris Seferovic running deep beyond the defense. Portugal struck a post in the 82nd when Nani directed a header to bounce slowly back across goal and safely away. Earlier, Portugal's defenders went close with shots that deflected just wide of goal, by left-back Raphael Guerreiro in the 37th and with Jose Fonte's volley in the 75th. Portugal's loss was its first in 15 competitive matches under coach Fernando Santos, almost two years after he took the job. 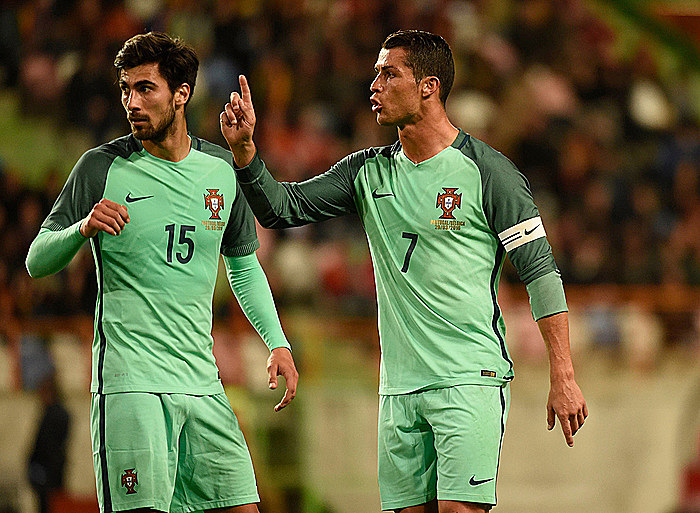 Defeat leaves Portugal in a familiar position, after also losing its opening Euro 2016 qualifying match. Two years ago, again without Ronaldo, Portugal lost 1-0 at home to Albania and coach Paulo Bento was fired. Portugal also failed to win its past two World Cup qualifying groups and advanced to the final tournament each time through the playoffs.